Another 100K Free Slots Tournament Has Been Launched At All Slots Online Casino. 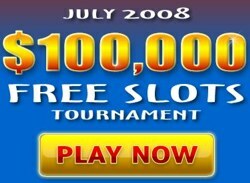 A FREE Slot Tournament running the entire month of July at All Slots and All Jackpots offers a top prize of $50,000, second prize of $10,000 and third prize of $5,000. Plus extra 200 prizes with the minimum prize $100. Each day the 50 top players will win a free ticket to the Finals to be held Aug 1-4, where $100K will be divided among the 200 top players. All Slots Online Casino, a proud member of the Jackpot Factory Group and a leading online slot casino, is making another big splash just in time for summer with a brand new $100,000 Free Slots Tournament that will award 200 cash prizes. Like previous slots freeroll tournaments, All Slots is hosting free semi-final events. The top 50 winners each day will win a free ticket to the $100,000 Main Event, scheduled for the first weekend in August. The tournament allows online players to view their standings in a real time environment, which further builds All Slots Casino's image as one of the most exciting casinos on the Internet today. Players who do not qualify in any of the semi-final events can buy into the $100,000 Main Event for $50. David Brickman, the Jackpot Factory's Vice President of Player Affairs, said, "The tournament is open to guests and remains unique in the sense that one can register and play in the $100,000 Free Slots Tournament without making a single deposit at the casino." "All Slots Casino has already made a solid claim for being the number one online slots tournament casino by hosting a $100,000 tournament earlier this year, but now we're showing the world that when we say number one, we mean it." What Are Live Slot Tournaments? Packed with loads of excitement, live slot tournaments enable you to compete against other online casino players for various prizes. The games work like regular slot machine games except that at the beginning of a tournament, each player is allotted a fixed number of coins and has a certain amount of time to wager this initial balance. When the tournament ends, the casino announces the official winners and immediately credits their accounts with corresponding winnings. How to take part in the tournament? Download free All Slots casino software and open a Real Money account. Find Tournaments in casino lobby. Starting July 1st through July 30th, play for free. On August 1st, you can guarantee your place in the final tournament for a $50 entry fee. All Slots Casino is an award-winning online casino that features over 350 scintillating casino games, including 21 progressive jackpot games, and a large amount of slots tournaments. One of the leading slots-focused casinos on the web, All Slots is powered by Microgaming and accredited by eCOGRA. The casino prides itself on fair play, honesty, and fast payouts.